This correspondence includes letters received by the Kansas Adjutant General on a variety of topics. Many of the letters request arms or troops to protect settlers from feared raids by Indians in the area. Many letters also inform the state of the enrollment of local militias for such protection in absence of assistance by state units. Requests for information on filing claims for militia service and damage from Indian raids are also included. The letters are addressed to Governor Thomas Osborn, former Adjutant General C. A. Morris, and acting Adjutant General H. T. Beman. 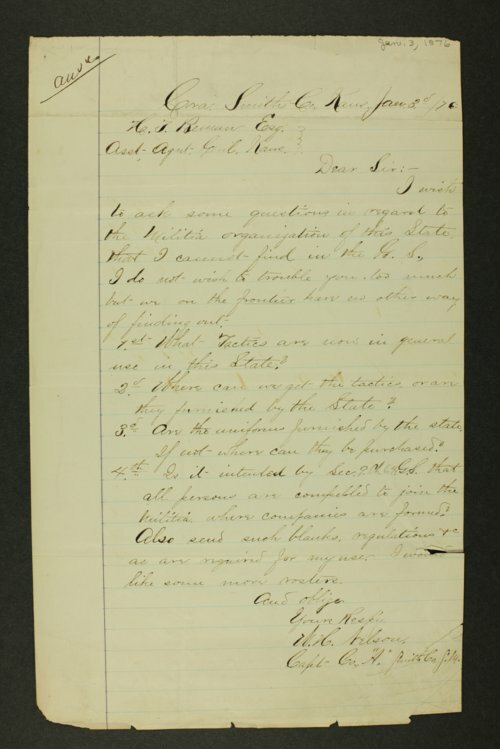 General John Pope, commander of the Department of the Missouri at Fort Leavenworth, sent letters on May 11th and May 15th directing companies of cavalry to be sent to observe the movements of Indian bands and protect settlements.